Point-of-care (POC) diagnosis, or near-patient testing, takes place wherever the patient is. In other words, it includes any screening or diagnostic test that is performed outside of a main hospital laboratory. The wider availability of POC testing is revolutionizing the continuum of the patient care process by providing laboratory results quickly and efficiently. A shorter turnaround time, as well as a quicker diagnosis leading to faster treatment, yield cost savings. The success of this approach relies on the development of miniaturized devices for POC testing. Emerging new technologies are allowing earlier adoption of smaller, more accurate, and easier-to-use devices. A Johns Hopkins startup called emocha Mobile Health has developed a platform of digital mobile applications that streamline the continuum of patient care. emocha is teaming up with miDIAGNOSTICS to enable mobile health solutions to perform diagnostic tests integrated in silicon chips. In other words, this series of tests will be available directly from mobile devices. As patients become increasingly willing to use new health tracking and monitoring technology, this could be a valuable way to connect patients with healthcare efficiently and affordably. In a statement, emocha said it hopes to add miDIAGNOSTICS POC testing to its mobile health interventions for a variety of uses, including medication adherence. miDIAGNOSTICS’ silicon chips act as miniaturized labs, able to detect cells, proteins, nucleic acids, or small molecules from a tiny volume of body fluid. Available in minutes, results can be shared via laptops, tablets, or smartphones, turning these devices into a mobile health solution for diagnostics at the point of need. emocha will add mobile data management to miDIAGNOSTICS’ devices. A mobile application will give users easy access to a diagnostic device to initiate tests and view results on their mobile devices. A cloud infrastructure will serve as a central hub that will transform miDIAGNOSTICS’ products into mobile health solutions that link patients’ lab results to providers and electronic health records. A dashboard will offer a customizable view of test results, allowing consolidation of tests and data analysis. Earlier this year, Spartan Bioscience said it was preparing to launch its Spartan Cube, which would change the face of personal DNA testing and be a serious disruption of the POC molecular diagnostic test market. The Spartan Cube is unimposing enough—it’s a small aluminum box, four inches cubed, bearing the logo of Spartan Bioscience. Paul Lem, CEO of Spartan Bioscience, told Motherboard in August that the Spartan Cube uses PCR to perform a range of diagnostics, including infectious disease and genetic tests, quicker and cheaper than many other DNA testing machines. Presently, the Cube’s medical tests are for research purposes only, intended for use at doctors’ offices, hospitals, and pharmacies. “I’m a medical doctor, so my Holy Grail is instant diagnosis and instant cure,” explained Lem to Motherboard. In a new study, BCC Research reveals that other key drivers of the POC diagnostics market include staff shortages, older populations, long-term cost savings, and rural locations without conventional laboratory services. More and more tests are being performed at the patient’s bedside, as well as at laboratories in physicians’ offices, outpatient clinics, emergency rooms, and intensive care units. Critical-care instruments that combine important chemistry, hematology, and hemostasis parameters have entered the market for POC testing in emergency and operating rooms, driving market demand. Cost containment is another key market driver. The faster a patient is admitted to an emergency room and diagnosed, presumably the shorter the patient’s hospital stay is, which yields cost savings. The shorter turnaround time for laboratory results also reduces costs. Managed care and Medicare cutbacks have placed financial pressures on hospitals, and POC testing has met the challenge of reducing costs while providing better patient care. Lower-cost POC devices are becoming more available for near-patient testing, the increased use of which should spur demand. 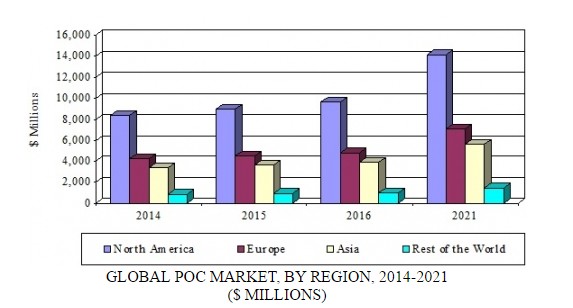 BCC Research’s Point of Care Diagnostics shows that the global POC diagnostics market will grow from $19.3 billion in 2016 to $28.3 billion in 2021, reflecting a five-year compound annual growth rate (CAGR) of 8.0%. The North American segment should reach $9.7 billion and $14.2 billion in 2016 and 2021, respectively, at a five-year CAGR of 8.0%. The European segment is anticipated to attain $7.1 billion by 2021, up from $4.8 billion in 2016, also at a five-year CAGR of 8.0%. Both Asia and the segment designated Rest of the World also have projected CAGRs of 8.0%. To that end, Siemens Healthineers announced on November 7 that it is acquiring Conworx Technology to flesh out its POC informatics capabilities. Siemens broke out its healthcare business in May, rebranding it as Siemens Healthineers. When the company was planning the split, it said it wanted to focus on big data analytics, molecular diagnostics, as well as POC and mobile healthcare. “[T]here is a huge need by emerging healthcare networks for seamless integration of hundreds of decentralized devices that are spread across dozens of sites,” said Peter Koerte, president of Siemens Healthineers’ POC diagnostics division, in a statement. Now, Conworx will become a new unit at Siemens and will deliver open connectivity for more than 100 POC devices from major manufacturers. This will enable seamless data integration from any manufacturer’s POC analyzer—managed by a single informatics solution to streamline operations and access to data while improving risk management. The new unit will focus on developing interfaces and applications as well as data management. A combined suite of products from both companies will be offered under a new subsidiary, Siemens Healthineers Point of Care Informatics. Conworx’ offerings include UniPOC, a Web-based, POC data management system that connects and manages POC devices in a single platform. The company also markets the POCcelerator, a POC testing management tool that manages devices, users, quality control materials, and controls in one system. These will be combined with Siemens’ RAPIDComm Data Management System.